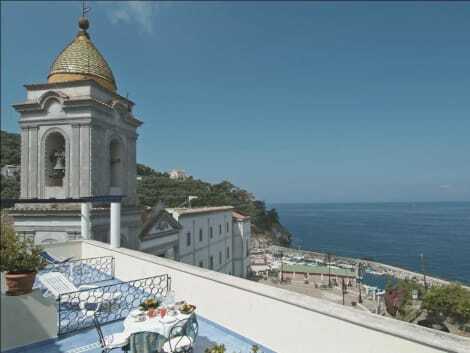 With panoramic views along the Sorrento Peninsula, Hotel Piccolo Paradiso is in Massa Lubrense. 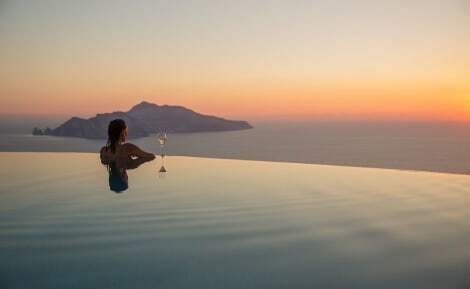 It has a free-form pool, a Campania restaurant, and Mediterranean-style rooms with satellite TV. Free Wi-Fi in shared areas. Rooms at the Piccolo Paradiso are all air conditioned. Each has a private bathroom with a toiletry set and luxurious bathrobes. The restaurant serves local cuisine and specialises in fish dishes. Guests can enjoy local Limoncello liqueur in the American bar. The sun terrace leads directly to Punta Lagno Beach. Sorrento Train Station, where the Circumvesuviana train departs from, is 8 km away. Featured amenities include express check-in, express check-out, and multilingual staff. A train station pick-up service is provided at no charge, and free self parking is available onsite. Make yourself at home in one of the 25 individually decorated guestrooms. Rooms have private furnished balconies or patios. Complimentary wireless Internet access keeps you connected, and satellite programming is available for your entertainment. Private bathrooms with bathtubs or showers feature complimentary toiletries and bidets. Located in Massa Lubrense, Melrose is near the bay, a 3-minute drive from Ancient Cathedral of Massa Lubrense and 10 minutes from Cala di Puolo Beach. This apartment is 2.8 mi (4.5 km) from Marina Grande Beach and 4.2 mi (6.7 km) from Piazza Tasso. Enjoy a meal at the restaurant or snacks in the 3 coffee shops/cafés. The hotel also offers room service (during limited hours). Relax with a refreshing drink from the poolside bar or one of the 2 bars/lounges. A complimentary hot/cold buffet breakfast is included. Take advantage of recreation opportunities such as an outdoor pool or take in the view from a rooftop terrace and a garden. This Mediterranean hotel also features complimentary wireless Internet access, concierge services, and babysitting/childcare (surcharge). Getting to nearby attractions is a breeze with the complimentary area shuttle that operates within 3 km. With a stay at Relais Blu in Massa Lubrense, you'll be within a 10-minute drive of Gulf of Naples and Punta Campanella Marine Reserve. This 4-star hotel is 8 mi (12.8 km) from Marina Grande Beach and 8.1 mi (13.1 km) from Corso Italia. With a stay at Hotel Caruso in Massa Lubrense, you'll be within a 10-minute drive of Gulf of Naples and Baia di Ieranto. This 4-star hotel is 8.1 mi (13 km) from Marina Grande Beach and 8.3 mi (13.3 km) from Corso Italia. lastminute.com has a fantastic range of hotels in Massa Lubrense, with everything from cheap hotels to luxurious five star accommodation available. We like to live up to our last minute name so remember you can book any one of our excellent Massa Lubrense hotels up until midnight and stay the same night.